In today’s episode we will be discussing the issue of gender pay gap in our society. According to World Economic Forum, which country has the biggest gender gap regarding economic participation and opportunity? Hi everyone, I’m Tom. Welcome to today’s programme. And I’m Sam, welcome to the programme. በዛሬው ዝግጅታችን ፆታን መሰረት ስላደረገ የክፍያ ልዩነት እናወራለን። ወደ ዜናው ከማምራታችን በፊት የዛሬው ጥያቄ ይሄው። የዓለም የምጣኔ ኃብት ፎረም እንደሚለው ከምጣኔ ኅብታዊ ተሳትፎ እና ዕድል ጋር በተያያዘ ትልቁ ፆታን መሰረት ያደረገ የክፍያ ልዩነት ያለባት አገር የትኛዋ ናት? Well, this is quite a difficult quiz. What do you think, Sam? I’m not sure either, actually. Right across Iceland on October the 24th last year, the women left work early, shaving 30 percent off their working day because in Iceland, they take home, on average, 30 percent less pay than men. Since then, the government has brought in rules that will make Iceland the first country to put in place a rigorous system to try and force companies to provide evidence that they’re paying men and women equally. Globally, on average, women take home just over half the wages of men, according to the world economic forum. Well, good on those women in Iceland. I think it’s outrageous that women are still paid so much less than men. Wow, steady Tom. Didn’t think you’d feel so strongly about this topic. I’m sorry, but there are a lot of women in my life who are very special to me and the idea that they take home less than men for doing exactly the same work, really upsets me. Take home ከግብር በኋላ እና ሌሎችም የሚቀናነሱ ነገሮች ከተቀነሱ በኋላ የሚወስዱት የገንዘብ ክፍያ ማለት ነው። I couldn't agree mpre Tom. Sounds like this topic is very personal to both of you. But, I have to say, I wasn’t really that surprised to hear that globally, women take home just over half the wage of men! I’m lost for words. I think we really need to do something about the issue of this gender pay gap. This gender pay gap is one thing, but women are discriminated against in other ways, too. Yeah. For example, women might be discriminated against when they go for promotions. To discriminate against’ ማግለል ማለት ነው። እዚህ ላይ ቅድም አንስተነው ለነበረው ጥያቄ ለምን መልሱን አንስጠዎትም? ከምጣኔ ኅብታዊ ተሳትፎ እና ዕድል ጋር በተያያዘ ትልቁ ፆታን መሰረት ያደረገ የክፍያ ልዩነት ያለባት አገር የትኛዋ ናት? መልሱ ሀ) ህንድ ነው። እርሷን በቅርብ በመከተል ደቡብ ኮርያ ስትገኝ ከእርሷ በኋላም ኢትዮጵያ አለች። Didn’t the news story say something about what Iceland is doing to tackle this issue? Do you mean the protest they held in Iceland? Ah yes, so to stop companies discriminating against women, they’re going to put in place a rigorous system whereby companies have to show that they’re paying men and women equally. ‘Rigorous system’ጥብቅ ስርዓት ማለት ነው። what a great idea. Yeah, but if you really want to get rid of the gender pay gap, I still think there’s a lot more that we could be doing. Ooh, do you mean like making the system more rigorous? Exactly! Why not just make everyone’s pay known to everybody else. This way, we’ll all know exactly who’s taking home what. The perfect solution Tom. In fact, why don’t we do it now? On the count of three, we tell each other how much we’re getting paid. Aren’t you two getting carried away a little? To take home a salary means 'to receive' a salary. It often refers to the money that employees receive after tax and other deductions have been made. She takes home about £2000 a month after tax. Studies show that on average women take home less pay than men. If you need to take home more money, you might need to change your job. The gender pay gap is the difference between men and women's average earnings. It can refer to the difference within an organisation, an industry or across a whole country. The finance industry has the largest gender pay gap. 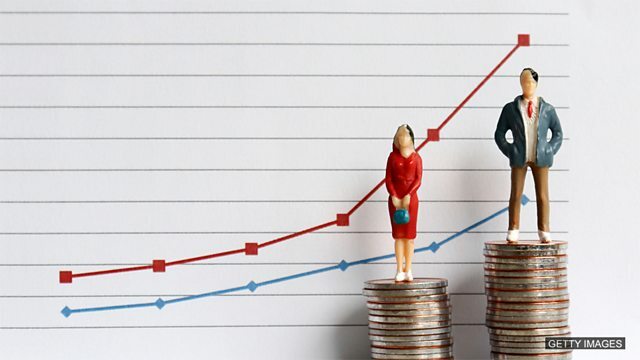 The government requires all companies to publish statistics about their gender pay gap. According to the OECD, Korea has the largest gender pay gap. To discriminate against someone is to treat them unfavourably. It is often used to refer to unfair treatment on the basis of gender, race, sexuality, age, etc. Salary data shows that many companies discriminate against women. We should take steps to stop people being discriminated against. Employers who discriminate against their employees can be taken to court. Something that is rigorous is thorough and does not overlook anything. Having a rigorous system will mean that we can stop all of these problems. Medical researchers have commissioned a rigorous study into this new illness. We must be rigorous in checking everything we make. The issue of _________ will only go away if we have more women in positions where they can make that change. It is a crime to __________ employees based on their gender. When I take away all the extra deductions from my pay, I __________ very little. To prevent office equipment going missing, the manager has put in place __________ of checking who uses what equipment. Do you think pay is unfair in your country? Do you think there is discrimination? Should there be a rigorous system in place? Tell us on our Facebook group.